Hi friends! I hope you're having a wonderful day! We went to the Children' Museum today and the kids had a blast! I'm a bit tired right now but nothing too bad. I wanted to share a couple more challenge cards with you today. I always feel the need to blog challenge cards right away because there have been so many times I didn't blog them on time and the challenge ended. First up, I made this card for the Some Odd Girl April Challenge (color challenge) as well as the Oozak Challenge #1 (anything goes.) I used Nutsy Kaylee for my card with a sentiment from Tiny Baker Tia. Can you believe how much I like those SOGies to color for them all the time? The ribbon is May Arts, washi tape is Love My Tapes, bling is Kaisercraft, the paper is Pink Paislee, and I used Copics to color. My next card is another one for the Lawnscaping #31 challenge (to color) and Card Positioning Systems sketch #259. The stamps and paper are from Lawn Fawn, I colored with Copics, accented with Stickles, and added a Zva bling flourish. I see you went with Nutsy Kaylee! :) Cute cards! aww these are both so amazing...I love your amazing coloring...great cards. SUPER SUPER cute--LOVE that first card with the tapes and colors! And that second card is one of my favs--LOVE the glittered pony/unicorn! SOOOOOOO FUN! Ooohhhhhhh......... Cute cards! 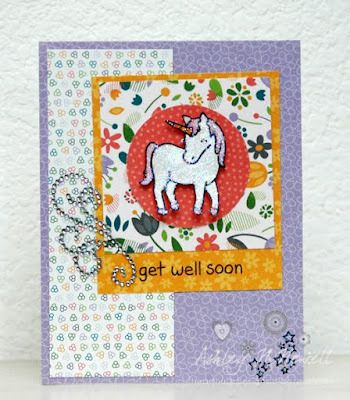 Love that sparkly unicorn. My oh my! ohhh how cute Kaylee is!!! I love that washi tape and woodgrain heart on the card.. it's so lovely!! So happy you joined us at Some Odd Girl! !